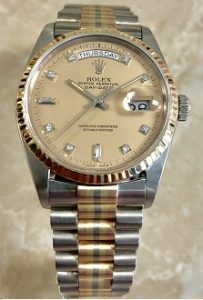 Pre-owned, in ABSOLUTE LIKE NEW CONDITION, WITH ORIGINAL ROLEX BOX, traditional 36mm, with all original Rolex champagne diamond dial. It is a rare combination of white gold, rose gold, and yellow gold case, with quick set day date, and sapphire crystal. Available with the Rolex President hidden clasp.